Between 1884 and 1908 different teams made their appearance in and around Cornafean. Some of these were Kilmore Rangers, Drumambry Emmetts, Drumbess Sons of Tyrconnell and Cornafean Tom Moronies. These teams usually took part in tournaments and occasionally in competitions. The best-known were the Moronies, which were formed in February 1889. They took their name from an old Fenian Tom Moroney. They were always available to play in the many tournaments, which were run every Sunday and were particularly active in 1890 and 1891. In 1891 they organised their own tournament in Cornafean in a field given for the occasion by John Patrick Johnston. Teams from Arva, Killeshandra, Ballinagh and Gowna took part. In the early years of the new century, and in particular 1904, ’05, and ’06 numerous splinter teams and townland combinations played occasional games. Examples of some of these teams were Drumbess Wolfe Tones, Drumora Volunteers, Ballyhillan Sons of Erin, Kilmore True Sons of St. Patrick, Losset Mulrooneys, Bruse Rovers, Lahard and Drumgoon. During these years the seeds of the association which where to blossom forth so successfully in later years were firmly sown in Cornafean land. All that was needed was some great force or movement to bring these disparate rural entities together into one strong united and purposeful combination. This leadership was provided by Pól McSeain when he founded a Gaelic League Branch in Cornafean in 1907 bringing his great organisational ability to bear on it activities. This movement captured the minds and hearts of many and attracted to Cornafean hall numerous people from different areas. This Gaelic League Cumann was part of a great cultural reawakening which was sweeping the country at this time. A great sense of comradeship and loyalty arose among the members and in these years a great Gaelic spirit was born which has permeated Cornafean ever since. A new athletic club was formed by the members attending the Gaelic League meetings with practises for football, hurling and athletics organised for Sunday afternoons. These practices were a great success and it was shortly after this that Pól McSeain brought the members of this Gaelic league cumann and members of the old Killeshandra Leaguers together at Farranseer lane, beside Cornafean Cross and a new club Cumann Naomh Fionnan was formed. This soon became popularly know as Cornafean Naomh Fionnan. Pól McSeain was born Paul Johnston in 1888. He was a son of John Patrick Johnston and Julia Reilly (Arva). He was brought up in the Fenian tradition and like his father John Patrick Johnston he identified himself from an early age with every national endeavour. He was very active at county board level and became secretary of Cavan Co Board GAA in 1909 at a time when his own father was chairman. As Co Board secretary he always signed his name in Irish as Pól MacSeain. Soon he become popularly known as Pól MacSeain and he retained that name ever since. He became secretary of the new Cumann Naomh Fionnan club and its chief organiser. Unlike the other teams this new team experienced success on the field and success bred success. Under Pól’s leadership the new club was able to transcend the local rivalries that had hitherto existed and unite the players into one powerful combination. He served as Chairman of Cavan Co Board GAA in 1926 and ’27 and was a great personality in Cavan GAA all his life. Cornafean Naomh Fionnan produced footballers that have done Cavan proud along with officers of the highest ability and integrity, who have served the County Board well. 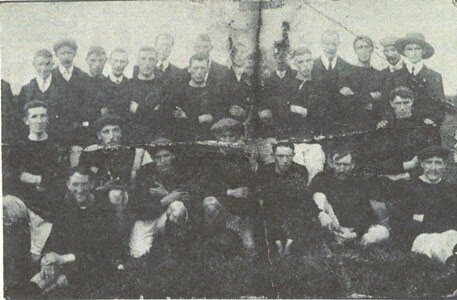 The club won their first championship in 1909 when they beat Crosserlough in the county final which was played in the Showgrounds, Cavan now Terry Coyle Park. The team which won the first ever-senior title was: Phil Reilly (goals), Terry Reilly (capt. ), Benny Reilly (vice-capt. ), Paddy O’Reilly, John O’Reilly, Benny O’Reilly, Paddy O’Reilly, John Joe O’Reilly, Sean McCormack, Pee McCormack, Paddy Gilronan, Joe Gilronan, Thomas Robinson, Thomas Farrelly, Thomas McKiernan, Michael Fleming and Pat Flood. Other senior championship successes followed in 1910, 1912, ’13’14’15, ’18 and 1920. In brief Cornafean had two golden eras in its illustrious history. They dominated Cavan club football in the 1910s and in the 1930s winning the bulk of their twenty senior championships in these two decades. The club contested every final between 1927-1943, winning in ’28, ’29, ’32, ’33, ’34, ’36, ’37, ’38, ’39, ’40 and ’43. In the 1920s and 1940s they were often the losing side in county finals. In the 1950s and ‘60s though seldom successful they were still a force always respected and feared. The rivalry between Cornafean and Cavan Slashers, Mullahoran and to a lesser extent Virginia, Bailieboro, Killinkere and Coootehill dominate this story. The great games with Cavan Slashers in the ‘30s and Mullahoran in the ‘40s were the showpieces of Cavan football and the standout as the high points of Cavan club football. Cornafean produced many outstanding footballers that did Cavan proud in their championship tussles in Ulster, in All-Ireland finals in Croke Park and in the Polo Grounds, New York. Some of these players wore the saffron jersey of Ulster with distinction and shared in their Railway Cup successes in the 1940s. Yet from a broad perspective over the most successful period of its history (1910-1945) the majority of the Cornafean teams were backboned by a small number of families many of whom were related. They came from either of two geographical pockets, which comprised a handful of townlands each. The first pocket lay roughly halfway between Cornafean and Killeshandra and comprised the townlands of Drumculion, Drumambry, Lahard, Drumgoon, Derries, Drumgoa, Drumconlester, and Drumhilla. Many of these townlands are joined together and from them came three families of O’Reillys, the McCormacks, Crottys, Youngs, McCleans, Dinnenys, and Phil Sheridan. The old Drumambry Emmetts team drew largely from this area. The second and larger pocket was situated about three miles away in an area southeast of Cornafean cross. It embraced the townlands of Drumora, Annagh, Farinseer, Drumcor, Shancor, Drumcoghill, Losset, Bruse, Mullaghboy and Coolbawn. From this cluster of townlands came three families of O’Reillys, the McKeons, Floods, McKiernans, Josie Martin, Willie Fitzpatrick, Peadar Doyle, Tom Brady, Paudge Masterson, Jamesy Masterson, Paddy Martin, Phil McCabe and Frank Fitzpatrick. A third and much smaller pocket lay in the heart of Kilmore parish near Drumcor chapel and from it came Phil Smith, Bob Millar, Seamus Maguire and his brothers, Liam and Dessie. Paddy Brady and Pat Galligan who played for a while in the 1930s also came from there. From 1910 to 1945 over thirty players from these three small areas wore the blue jersey of Cavan at senior level with distinction. Down through the years, Cornafean has always been able to attract a quality player from an outlying area. This was partly due to its successes and partly because it meant recognition for someone who might otherwise have gone unnoticed on a junior team. It gave a player an opportunity to perform at the highest level against top class opposition and this was necessary if he were ever to advance to the Cavan senior team. In this respect Cornafean benefited enormously from John P Murphy, Benny Fay, Jimmy Murphy, Packy Phair, Packy Devlin, James Brady, Peter Paul Galligan, Tommy Connolly, Sonny McGahern and Seamus Morris. When Cavan defeated Kildare. The best-known Cornafean player is John Joe O’Reilly who captained Cavan to victory in the All-Ireland finals of 1947 against Kerry in the Polo Grounds, New York and again in 1948 when Cavan defeated Mayo. Liam Maguire Des Maguire and Seamus Morris featured on the All-Ireland winning team of 1952. Since then if titles are the yardstick to measure success by, the history of the club during the last fifty years makes depressing reading. Rural depopulation especially in the later 1940s and throughout the 1950s has had a serious effect on this great Gaelic stronghold and they haven’t won a single senior title since 1956. However, the great spirit and commitment for which the area is renowned has manifested itself in other ways in leaner times. The fine new park opened in 1964 provided mainly through voluntary effort a facility, which at that stage other clubs only dreamed of. In 1988 a stand was added for spectator comfort. In 2004 a fine new community centre was built with a large multi-purpose hall. In 2008 new dressing and meeting rooms were built and in 2009 a second pitch was added to the existing pitch to cater for the different teams representing the club. Back row left to right- Tanasie Kildalis, Brian Caffrey, Michael McGibney, Val Sheridan, Philip Wilson, Pauric Smith, Cathal Sheridan, Rory McSeain, Cillian Tully, Brian Doyle, Ciaran Martin, Seamus Doyle. Middle- John Reilly, Thomas McKiernan, Liam Young, Oliver Gormley, Eamon O’Reilly, Art McSeain, Eamon Gaffney, Ciaran McSeain, Paul Harrington, Brendan Geoghegan. Over the past forty years the club has had many lean years. However the well-being of a GAA club isn’t always dependent on success and success can be measured in different ways. In 1969 Scór, which is the GAAs winter talent competition was established, and since then Cornafean has won numerous county, provincial and All-Ireland titles. These achievements have brought fabulous entertainment to the community. In August 2008 the club celebrated its centenary. The celebrations focused on a two-week festival period during August when the young and old celebrated. Some of the activities included a sports’ day, novelty football matches, barbeque, Irish night, Scor concerts etc. The highlight of the celebrations was a Centenary Banquet in the Hotel Kilmore attended by over 300 people at which Nickey Brennan, Uachtarán Cumann Lúthchleas Gael was the guest of honour. The club could look back with pride on a century of unbroken service to the GAA. Over the past hundred years the GAA has transformed this rural townland of Cavan. As a geographical unit Cornafean is still a small townland but achievements on the football field has made the name of Cornafean as renowned as great clubs like St. Vincents in Dublin, Glen Rovers in Cork, Tuam Stars in Galway and more recently Crossmaglen Rangers in Armagh. The tragic death of Commdt John Joe O’Reilly, at the Curragh Military Hospital on 22 November 1952, robbed Cavan, and indeed the nation, of one of its finest sons. 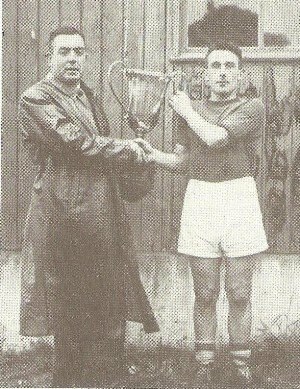 John Joe was a native of the Derries, near Killeshandra and played his early football with Cornafean and in St. Patrick’s College where he played on the McRory Cup winning teams in 1935, ‘36 and ‘37. He played with Cornafean, with whom he won Senior County Championship medals in 1936 and 1937, until he moved to Kildare in 1937 to take up a career with the Defence Forces. Thereafter he was obliged to play with the Curragh team in Kildare and his loss in footballing terms to Cornafean throughout the 1940’s was immense. "John Joe became a legend in his lifetime…… I unhesitatingly pick John Joe O’Reilly as my ideal of the great footballing captain. The Polo Grounds in 1947 was his finest hour – leading Cavan to an historic win from the very jaws of defeat. You see his photograph in army uniform in homes in Cavan and this in a way is a salute to a player and a captain who stood apart". He played with Cavan from 1937 until the early 1950’s and in six All-Ireland finals, between 1937 and 1949. He also captained the Ulster teams which won the Railway Cup in 1942 and 1943. His greatest achievement was undoubtedly to captain the Cavan team which beat Kerry in the famed 1947 All Ireland Final, played in the Polo Grounds, New York. This game was transmitted live back to Ireland by Radio Eireann with commentary by Micheál O’Hehir, and has been fondly remembered by generations of followers as a milestone in GAA history. Equally, the footballing skills and leadership qualities shown by John Joe have also remained in the collective folk memory of Gaelic Football throughout the decades. The late Fr. Dan Gallogly, in "Cavan’s Football Story" summed up the thoughts of many when he wrote of John Joe " No other person from Cavan in modern times has won such a permanent place in the memory of his own people. He is still remembered with pride and affection by Cavanmen everywhere and indeed by all patrons of gaelic football. He is still very much the ‘Gallant John Joe’, the lost leader of Cavan football.". In 1999, John Joe was nominated at centre-half back in the An Post/GAA Team of the Millennium. As a result, special commemorative stamp was commissioned in his honour by An Post. Cornafean GFC marked the event by organising a special programme of celebrations in November 1999. The Plan of Campaign was a strategy conceived by Tim Healy, William O'Brian, John Dillon and The Irish National League between 1886 and 1891 for the defence of tenant farmers against absentee rack rent Landlords. A depression in farm prices and bad weather in 1885 and 1886 made it harder for tenants to pay rents. This led to an increase in evictions. Following protests the landlords reduced their rents by about 10% or 15% but the tenants demanded about 40%. The idea of the Plan was that a tenant would offer The Landlord what he considered a fair rent. If this wasn't accepted he would pay the money to The Campaign instead who in turn would support him in the event of an eviction. Some farmers went along with the Plan and offered rents based on their own estimates, which were refused, quickly followed by an eviction. In order to test if it was legal to evict someone who had made an effort to pay even a reduced rent The Campaign needed to contest an eviction in court. In the village of Herbertstown near Hospital Co Limerick, on the O’Grady estate, lived Tom Moroney. Tom was involved with the Fenian movement in his younger days but was now fairly well to do. He operated a sizeable dairy farm and he was the proprietor of a pub and grocery business, a forge, five houses and the fair green on the hill above the village. Tom was a good tenant and was always able to pay the rent but in 1886, in collusion with the Plan of Campaign, things were going to be different. A big show was made of Tom selling some cattle to pay the rent. Of course the money raised was not enough to cover the rent demanded and it was refused. The money was then paid over to The Campaign. Tom was duly evicted but not before dozens of local farmers arrived at his farm with horses and carts and removed all his stock and fodder. The Landlord knew that Tom had other means but, as he had not paid his rent, he was deemed to be bankrupt and on January 28th 1887 Tom appeared before Mr Justice Walter Boyd in the bankruptcy court. There he refused to take The Oath or to answer questions put to him by O’Grady’s lawyer, a Mr Gerrard, about what happened to his rent money, or to reveal the income from his business interests, or the tolls from the fair green. As a result Justice Boyd committed him to Kilmainham gaol for contempt of court. This sentence was a bit of a surprise to Tom and the people of Hospital in general, but it was a boon to The Plan of Campaign. The following week, two receivers from the Bankruptcy Court, accompanied by a force of RIC officers, sent to assess Tom’s property met with violent opposition when proceeding from Limerick to Herbertstown and there were several clashes between the people and the police. A wall of stones was placed across the road near the village, and an attempt was made to barricade Moroney's premises. The receivers, however, accomplished their mission but they were pelted with mud and stones. From then on receivers and bailiffs were unable to hire hackneys and needed continued police protection. One receiver who did manage to get to Moroney’s pub had to be content with seizing two empty porter barrels, much to the jeers of the villagers, as all the other stock had disappeared. Much was made of the injustice of the sentence and Judge Boyd and the Landlords came in for much derision in the local newspapers. Meanwhile Tom still languished in Kilmainham but he had many visitors who reported that he was bearing up well and was in good spirits. One visitor found him dressed in a drab grey tweed suit, but he kept the flag flying by wearing a green neck tie. He didn't complain about the conditions, as the Governor was present, but he joked that whenever he got out he would be a great washerwoman. Meanwhile six other tenants on the estate were evicted and some spent time in Limerick prison for various offences under The Coercion Act relating to rioting and interfering with receivers following Tom’s imprisonment. The local priest, Fr Mathew Ryan, also found himself in gaol on two occasions. This was despite the Papal Encyclical "Saepe Nos" issued on 20Th April 1888 which condemned the Plan of Campaign and all clerical involvement in it, as well as boycotting. The Landlord Thomas De Courcy O’Grady, (The O’Grady) claimed that being Irish and resident he understood his tenant’s difficulties and knowing most of them personally he was reluctant to evict. He was quite offended that The Plan of Campaign had picked on him. The O’Grady eventually offered a reduction in the rent which was agreeable to the tenants but they refused to pay it so long as Tom remained in prison. The court, and Judge Boyd, said that it was out of their hands and that it was up to Moroney to purge his contempt. This wasn't going to happen and Tom remained in Kilmainham, and the clamour for his release continued. As time wore on Tom’s predicament became known throughout the country and many petitions were launched calling for his release. Many Town Commissions, Corporations and Grand Juries also added their voices. 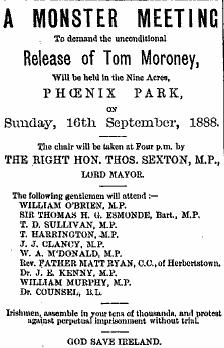 In the summer of 1888 a large demonstration in support of Tom was held in The Phoenix Park which up to fifty thousand Dublin people attended. The Nine Acres were filled with people, and bands from various trade and other societies with their banners led the various deputations. Later in 1888 Tom was still in gaol, still defiant but his health was becoming a concern. Over the autumn his case began to be mentioned in Parliament in London, It was brought up by The Irish Parliamentary Party who proposed several motions calling for his release. These were all defeated. However, a Liberal M.P. named Charles Bradlaugh, an associate of Parnell’s and a Mr Coneybeare took up the cause and made a very strong case for clemency owing to Tom’s deteriorating health. It was said that Tom’s hair had gone grey while in prison and his mind was “unsettled”. Eventually clemency was granted but it took a word in Judge Boyd's ear from The O'Grady for him to drop the contempt charge. Tom was reluctant to come out in these circumstances but he was eventually released on December 14th, almost two years after his incarceration. By the way, Mr Bradlaugh himself had caused some controversy just a few years earlier on his first election to Parliament because he would not take the Oath of Allegiance, as he was an atheist. Tom received a hero’s welcome on his arrival at Knocklong railway station and was cheered all along the road to Hospital where a platform was erected for an official welcome home ceremony. There were speeches by local campaign leaders and by Fr Ryan. Tom only said a few words. Then it was on to Herbertstown with bonfires on the hilltops and every house along the way bedecked with flags and bunting and blazing tar barrels at every crossroads. There was another welcome ceremony in the fair green, which had been renamed Campaign Hill in honour of the "lion-hearted" Tom Moroney. Following his release a testimonial was launched to raise money to “restore Tom to his fortune”. One of the first contributors was The Most Rev. Dr. Croke, Archbishop of Cashel and first patron of The GAA who donated £5 to the fund hoping that Tom's prolonged imprisonment and consequent losses, financial and physical, would prove a considerable success as regards results for the country. His property was not reinstated until eight years later. Despite his prison ordeal Tom was unrepentant and early in 1889 he came to the notice of the authorities again for interfering with receivers and urging tenants not to pay the rent. For a year or so after his release Tom was a regular guest at Land League meetings and demonstrations. In 1890 the Kitty O’Shea affair split the Irish Parliamentary party and, with other things on the politician’s minds, the campaign fizzled out. The various land acts over the next few years resolved a lot of the land problems. In January 1898 the fair in Herbetstown, which had lapsed when Tom was in prison, was revived and held on Campaign Hill and, by all accounts, was a great success. Tom died on December 7th 1899, of heart disease. He was sixty nine. The Tom Moroney affair was big in the news both at home and abroad when the first Gaelic Football club was formed in Cornafean in February 1889, just two months after Tom’s release from prison, so it is not surprising that it was named in his honour. By 1907 Cornafean Tom Moronies were still in existence but when Cornafean Naomh Fionnan was formed in 1908 Tom was no longer an icon and he had faded from memory, and from history. This Tom Moroney poem was written by a T.S. Cleary who was a regular contributor to “United Ireland” and other newspapers. He seems to have his geography slightly askew in the line “And through the land on every hand, from Quilty to Rathcloney”. While the line suits the rhyme, the towns mentioned are in Co Clare, not Co Limerick where the action took place. However, at the same time Co Clare had its own Tom Moroney. This Tom Moroney operated a passenger and goods transfer service between Miltown Malbay and the local West Clare Railway station, with his donkey and cart. On February 13th 1888 Tom and ten other business people from the town were sentenced to a month in prison for operating a Boycott against local Landlord Mrs Burdett Moroney and her employees. During their imprisonment all their neighbours rallied round with donations of turf and potatoes and a large demonstration was held in Miltown Malbay. On their release from Limerick Prison they were greeted by a large crowd of well-wishers and the Victualler’s Brass Band marched them through the city to the station. Either man would have been a worthy icon for the club but on balance it was more likely to have been the Co Limerick Tom Moroney, given the amount of publicity he was getting at the time. Cornafean Tom Moronies were not the only team to honour him. In Co Kilkenny Pilltown Tom Moronies were a famous hurling team and, in Co Cavan, Tullytrean Tom Moronies were playing in 1905.